Our 'HotHog' Package - one of our hogs roasted to perfection and delivered to you hot out of our roaster ready for you to carve & serve. Well we say 'carve', but we roast our hogs slowly up to over 90 degrees deep down which means that your pork will literally fall off the bone, so you can pull it with ease. Not much carving involved generally. 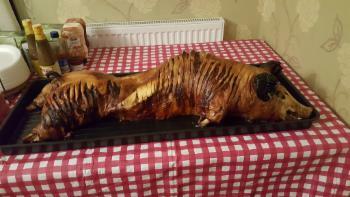 This is the simple DIY hog roast great for parties at home, in the garden, function rooms, restaurants, pubs, hotels and so on all year round. 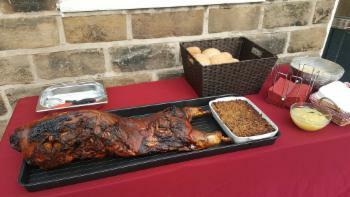 With no hog roast machine the hog can be served indoors at venues where they do not allowing cooking inside, and without having to keep an eye on a hog roasting it frees up more time for you to enjoy your event. Whole lamb or Boer goat can also be roasted, along with beef joints or chicken & turkey, and we can add various sides if required. A bit like dialing for a takeaway! From 2019 our HotHog Packages include your HotHog delivered* ready to carve & serve, freshly baked bread rolls, sage & onion stuffing and Bramley apple sauce and a tray to contain the juices as you carve or pull your pork. 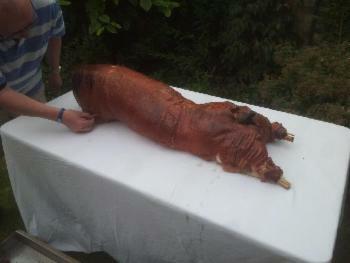 You just need a table or counter to rest your pig on, a bread knife, carving knife and serving tongs / spoons. We can give you some guidance on how to carve it and then its all yours to enjoy. Easy, simple and great value for money. 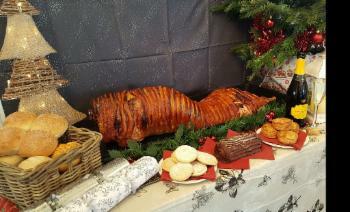 When your roasted hog is carried into your event it always gets the wow factor! *Additional delivery charges may apply when delivering over 20 miles from our base. Please email food@keythorpe.co.uk with your required booking date, delivery time and postcode before checking out! PayPal still charge us a fee when we process a refund and so a £4 charge is levied to all refunds on purchases made without firstly checking the date with us. ** The tray that your hog is delivered is reusable - feel free to return it to us by either dropping off our courier and we'll ensure it's used again and refund you £5, or save it for next time you order a HotHog and do a swop with us and get £5 refunded, or put it to good use around your home - perhaps stand plant pots on it or a tomato bag to prevent spills, use it for muddy boots, pop it under the car in the garage to prevent oil stains, or use it for a messy activity with the kids. If you have your own use do let us know, and send us pictures! A firm surface to put the hog on, along with the rolls, stuffing and apple sauce. Two 4' tables are plenty. Some tongs and a carving knife for the pork, and if you have them poultry shears for the crackling. Be ready to start carving when the HotHog arrives. Where so I start? We recommend working on half the pig, one side, at a time to retain heat (by leaving it's crackling jacket on the other half). Whilst the crackling jacket is in place the heat is retained really well in the hog. The Crackling - If you have poultry shears cut the crackling off in strips and use them to break it up into bite sized pieces. If not, the use a knife carefully. The scoring will be a natural break. Strip the crackling from one side of the hogso you can get at all the lovely pork. 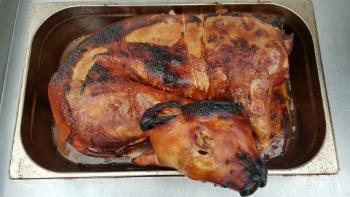 The crackling towards the belly will not be so good so discard. Stripping / Carving - Most of the pork will 'pull'. You'll have alot of meat from the shoulder and leg, and down the loin either side of the back bone. Because we've taken the hog to over 90 degrees Cecius internally the loin meat can be a bit drier, but mix all your meat together, the dry loin, the meaty shoulder and leg, the rib meat and the juicy fatty belly before serving and then each mouthful will be awesome. The shoulder bones and leg should just pull out leaving the meat. The ribs should all do the same, Discard these bones, cooked bone are no treat for pets as they will shatter (only ever feed raw bones). Use the tongs or your fingers (wash your hands before starting!) to pull and break the meat into small peices easy to serve into the bread rolls. Break up the rib meat. Pull off the belly meat. As you get deep around the leg and shoulder you may need to carve a little - play it by ear. Use your fingers to feel your way, discarding any sinu, bones etc as you go but harvesting all that tasty meat. Portion control - it's on you! The size of pig, with the size of roll, a serving of stuffing, a blob of apple sauce and a nice covering of pork will easily serve the number of portions stated. To help you guage that you're getting it right, if say you've ordered a hog for 80 guests, we'll generally supply 100 rolls. Split the rolls into two stacks of 40 and then the 20 spare. You should be onto the second pile of rolls before or as you start stripping the second half of the hog - this means your about right with your portion control. If someone asks for no bread, move a roll to the spares pile to keep track, and don't go overboard giving extra pork in leau of bread roll unless you're onto the second pile of rolls and still serving the first side, or if you've ordered a bigger pig than needed.